Ben More on Mull is the only Munro on an island other than Skye. It is a splendid mountain with narrow ridges and some scrambling opportunities. The summit lies at the intersection of three ridges, a short and very narrow ridge NE to A' Chioch, a S ridge curving SW to Maol nan Damh, and a NW ridge which splits to give branches WNW and NW enclosing Coire nam Fuaran. The slopes are generally moderate lower down becoming steeper and craggier higher up. 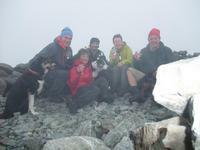 The summit is of rock and scree. 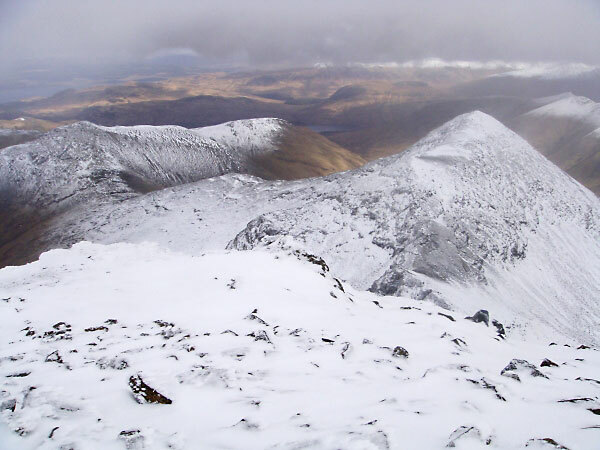 Normal ascent routes are from Gleann na Beinne Fada to the col between Beinn Fhada and A' Chioch or on the WNW branch of the NW ridge via the path from Dhiseig. Coming down Ben More, manage to get a quick view before the cloud returned. A'Chioch from the summit of Ben More(Mull) March 08. Ben More viewed from the Kinloch Arms, south of Ben More. 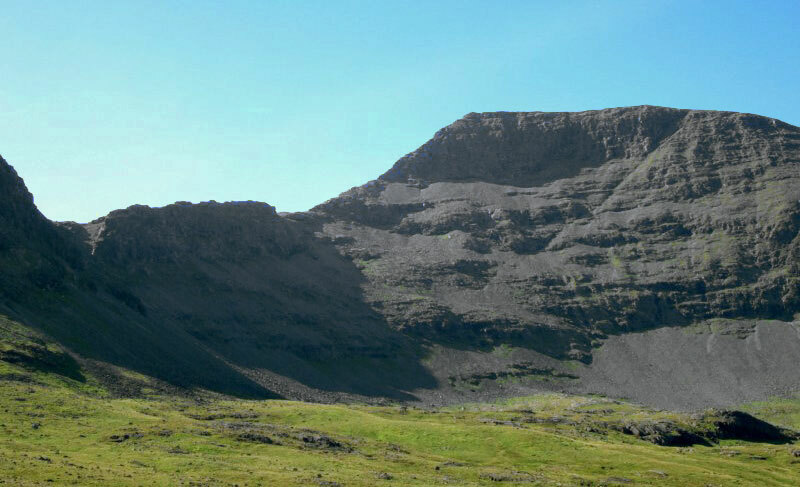 The summary information of one or more ascent routes that include Ben More [Isle of Mull]. 1 1180 m 12.25 km 4.5 hrs Ben More [Isle of Mull] Moderate with some scrambling required. 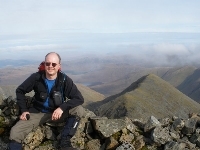 Post a few words about Ben More [Isle of Mull] or read what others have had to say. 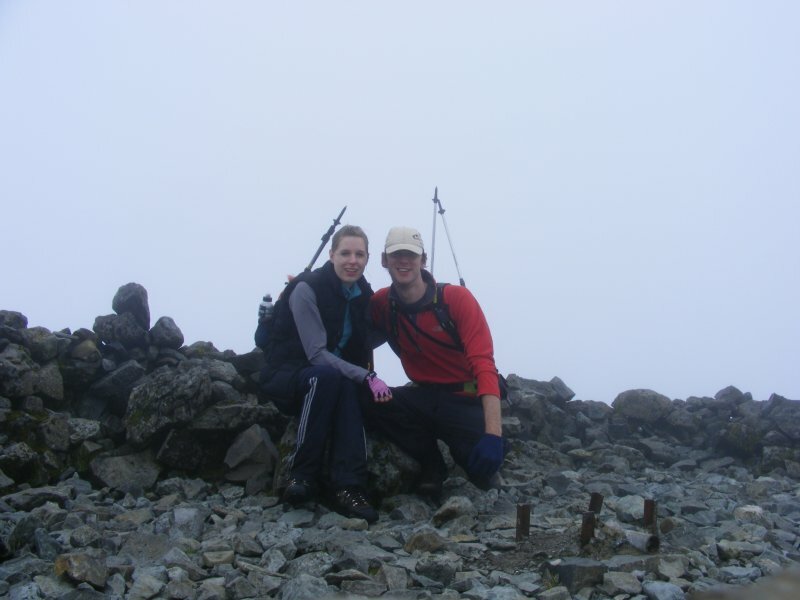 This was my first Munro and if I had known prior to starting how tough the A’Chioch route was going to be I would have gone for the Dhiseig route instead. I am delighted now that I have completed it that I selected the route I did. The day we walked this route the ground was very boggy for the first 300 mtrs of ascent but dried out considerably after that. The Ridge to A’Chioch and on to Ben More was stunning and also fairly challenging for a novice. No Views from the top but delighted to have completed my first Munro after a 20 year absence from the hills. Climbed in perfect conditions on Valentine's day 2004. A chilly start, with lots of verglass on the A'Chioch ridge, which had its moments. Stunning views from the top, although the cloudless sky now had bits of mist floating by. Rapid descent NW down Abhainn Dhiseig - an ascent this way would be far less interesting - go for A'Chioch ridge! Back in time for Roast lunch and then spent the afternoon drinking wine and eating heart-shaped chocolates on the beach at Aros (near Salen) in t-shirt weather (yes! in February). If only Scotland had won the Rugby it would have been a perfect day. I've been up this hill twice, though never by the A'Chioch ridge, and its one of my favourite mountains in Scotland. For people who have done it before, any maybe want to try a different way up, I recommend the South Ridge. The hill seems much more imposing when seen from there, (especially from across Loch Scridain) and the final section is fairly steep and rocky and worth the effort of not doing it from the North. Which is the main way to climb it. My father and I decided on the A'chioch approach to Ben More. We started the route from the B8035 and followed the Abhainn na h'Uamha past some lovely waterfalls through some very boggy ground up onto the bealach between Beinn Fhada and A'Chioch. Then turned south for a steep pull on a poorly defined path up onto A'Chioch. Then followed the ridge up on to Ben More. The final pull up onto the summit looks daunting but this is the correct way and is not has hard as it looks. We then descended on a well defined path north west down to the farm at Dhiseig.